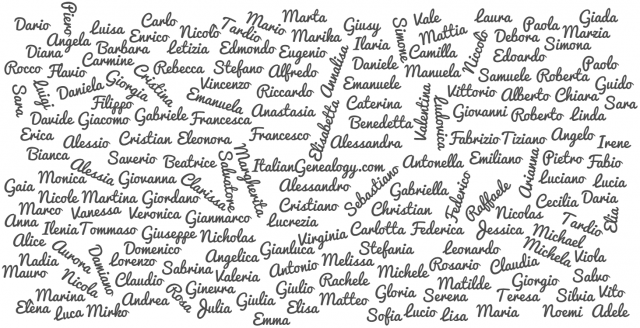 Are you looking for an Italian surname? Do you need more information about your family heritage? This is the right place to start your genealogy search. On the eight line (Giuseppe Puma, mother is a Morreale) of this 10 year death index, I cannot make out the number of the 1893 death record number. I thought it was 27, but that wasn't it when i searched the actual death records for 1893. I tried every two digit number ending in 7, but none of them were the record. What do you think the record number is? Marty, thanks. You were right. Unfortunately for me, it is not the Giuseppe Puma that I hoped would be there. I have been trying to find the Racalmuto death record of a Giuseppe Puma who was married to Rosa Taffuto and was deceased in 1897 when his son, Salvatore Puma, age 21, married Margherita Sentino(?) - marriage record # 75. Using his son's age, I figured that he must have died between 1875 - 1897. I have all the death indices from Racalmuto, so I thought that it would be easy to find it through going through all the Giuseppe Puma deaths listed in those indices in that 22 year period. Yet, I failed.